Developer: Playground Games; Turn 10 Studios. Turn 10’s Forza series has been a valuable exclusive for Microsoft, offering gamers a worthy alternative to Gran Turismo with accessibly deep racing. 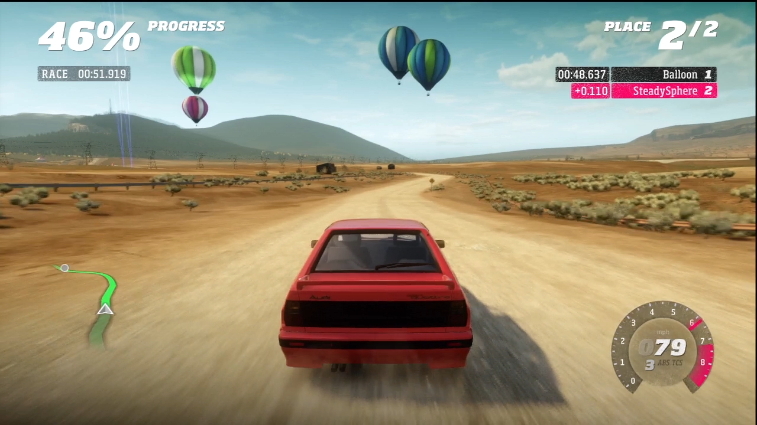 In a year populated with stiff racing competition from the likes of NFS: Most Wanted and Dirt Showdown, gamers were then treated to Forza Horizon. Turn 10 oversaw the project, but it was otherwise developed by Playground Games, a studio comprised of former employees from Bizarre Creations, Codemasters, Criterion and more. There’s certainly a lot of talent behind the wheel, but they also have the added pressure of Horizon marking a huge departure from previous games, as simulation elements are entrenched in an open-world format. It’s a risky prospect which could have gone either way. 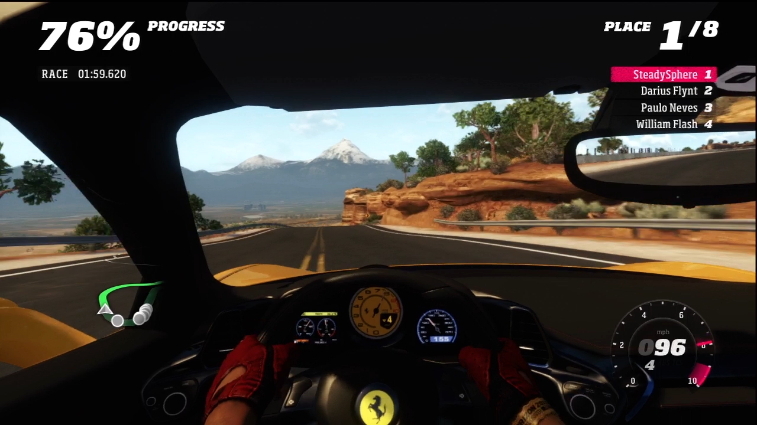 Playground Games have taken the core essentials of a Forza game and combined them with an open-world. 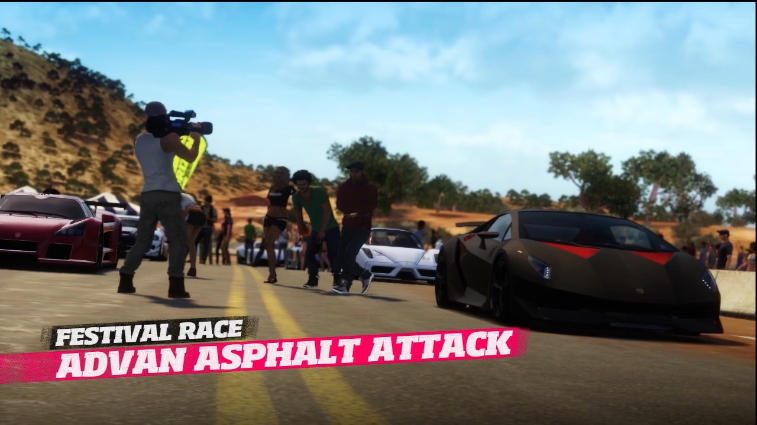 Many options and assists are still available, including the driving-line and rewind, but now gamers can race along the roads of Colorado. And though not huge, the beautiful scenery is gorgeous to drive by while the bustling festival atmosphere is endearing. The driving mostly translates well into a sandbox environment, but some issues rear their ugly head. The physics seem borked, as small lumps cause your car to completely flip. Collisions too can be odd, as while some fences and signs can be busted, lamp posts and even some of the bushes cause your car to stop. Hitting traffic also feels strange, as they don’t transmit any feeling of feedback on to your vehicle and instead just cause your car to slow down. None the less, racing is still great. Horizon is tied together with a festival-style structure. Events are bracketed into different coloured wristbands, which the player is rewarded with as you earn more points from events, until you earn the coveted gold wristband. It’ll probably take you about seven hours to reach the end without completing all the events, and only a couple more to finish off all 70 festival races. There are some extra ancillary activities at least. Strewn around the world are Discount Boards, which add a discount percentage per board until all 100 give you free upgrades. 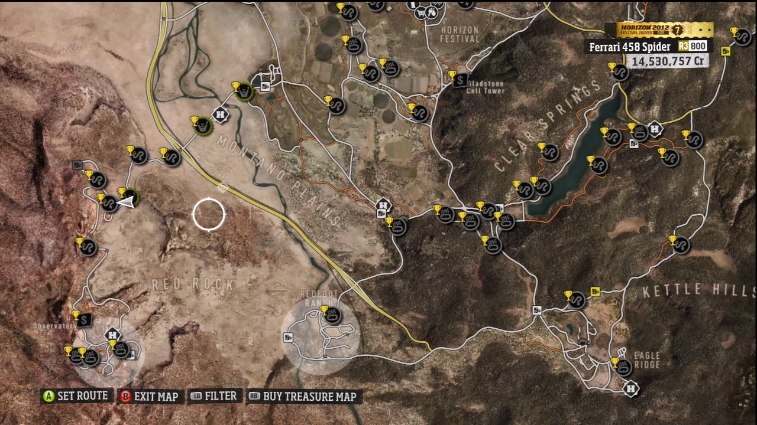 There are also outposts to discover, which allow you to partake in special PR stunts, as well as speed traps strewn around the map. Even then, you could probably explore all of Horizon’s content within 15 hours which feels a little light, especially when compared to its predecessors. Outside of the main events, a constant ranking system is integrated. Popularity is different from earning Wristbands, as rather than just winning, you’re challenged to do so in style. Performing drifts, avoiding oncoming traffic and destroying objects earns points, and doing these in quick succession creates a combo. As you earn points, your rank increases. Starting at Rank 250, earning ranks unlocks special showcase events, usually tasking you with racing Planes or Balloons for example. It’s a cool system which encourages you to do more than simply race, giving an arcade edge to each event. More often than not, you’ll find yourself trying to mix in showboat manoeuvres in order to keep your popularity meter increasing, though on harder difficulties this is difficult to balance. 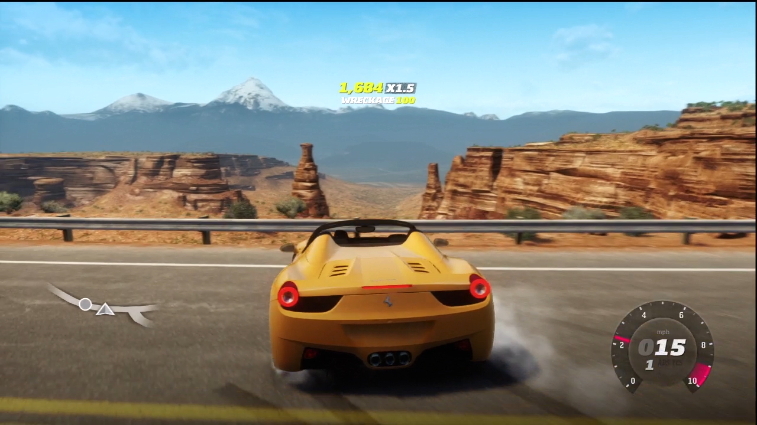 Other elements push Forza Horizon away from its simulation roots. Most events are now endurance races rather than circuits – although they still make an appearance – tasking you to drive from Point A to B. It’s a shame these don’t utilise the open-world a bit more, plotting a direct route for you rather than letting the player improvise. Other elements feel disappointing. Customisation options in terms of vinyl designs are identical to the last game, and on top of that, some in-depth tuning options added in Forza 4, which include tweaking tire pressures and the like, have been removed. 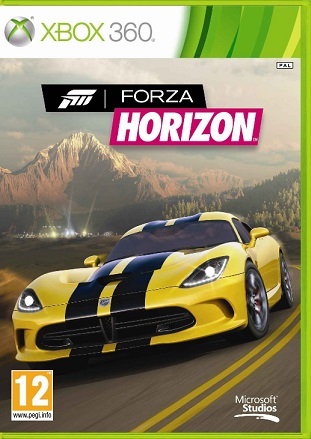 It’s certainly refreshing, but the missing features are disappoint, and Horizon does lose its identity somewhat among other racing games. A mostly-satisfying online component will keep you engaged for the long haul. The game does allow you to free-roam and even complete special co-op challenges, but these feel lame. Only the host can begin these challenges and the game fails to notify you where these challenges are located. The racing stuff is ace though. Special playlists allow players to find their comfortable level of competition, as Beginner and Social playlists are mixed with skill-based lobbies, and you can create your own custom games too. Racing earns you XP whilst the Popularity system remains present, adding a multiplier to your XP rewards, whilst each level rewards you with either a new car or cash. 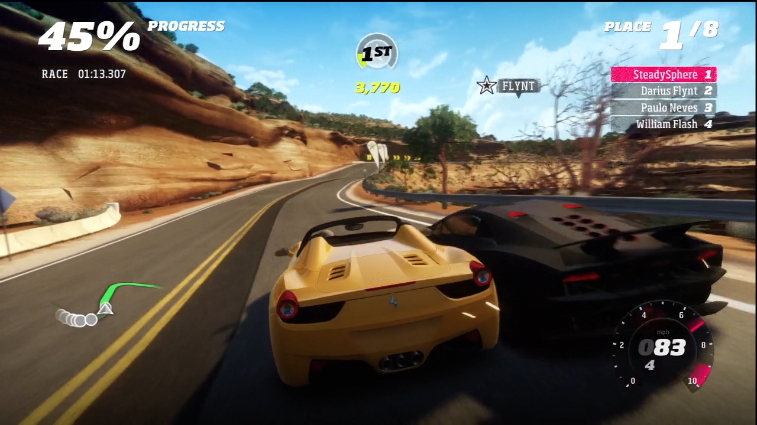 Other online features such as Speed Trap leaderboards in single-player, which allow you to intensify competition between friends, are cool. Horizon is simply a gorgeous game. The star of the show is Colorado which is technically proficient, featuring very little instances of bad texturing or geometry, and artistically stunning. Many beautiful environments crop up, such as wide mountain ranges, and these encourage photo shoots. Car models remain great, with good reflections and lighting from the exterior. It’s let down by poor damage modelling, where huge crashes cause little damage to your car, but Horizon’s still a really pretty game. Audio is excellent too; each car has its own distinct engine note, which is a nice touch and adds to the realistic modelling. The soundtrack is terrific, ranging from New Order to Arctic Monkeys. The music is divided into three distinct radio stations, which widens the appeal greatly. More of an upbeat party than a revolution in racing games, Forza Horizon manages to survive the transition from simulation to arcade. Its identity isn’t as prominent as earlier instalments, but the vibrant world and cheery atmosphere make this easy to forgive. The racing remains as fun as before, still coming with more difficulty options than you can shake a stick at, while some of the new arcade elements feel well-implemented. It’s let down by some wonky physics and a lack of single-player content, but multiplayer extends the lifespan with fun modes and accessible playlists. Playground Games have crafted a game that ticks all the right boxes, and even if it doesn’t add anything new, racing fans would do well to purchase this peppy little racer.